In this 2013 interview, Agustín Guillamón, the author of Ready for Revolution: The CNT Defense Committees in Barcelona, 1933-1938, discusses the Spanish Revolution, the reasons why he dedicated his life to this subject, its historiography and its lessons. Txema Bofill (for Catalunya: Òrgan d’expressió de la CGT de Catalunya): Tell us about how and why you became politically aware? Agustín Guillamón: My paternal grandfather was the youngest in a family with eleven children, born in the “Ravine of Hunger”, as its inhabitants called the mountains of the region of Alt Millars, between Castellón and Teruel. During the First World War they moved to Barcelona. The terrible shortage of both work and housing there caused them to leave Poblenou for the safe refuge (from the police or hunger) of the house of his sister, in Olesa. My grandfather, along with several of his brothers, was a member of a Confederal Defense Committee. He had a CNT membership card dated from April 1931. He went to work in the chemical industry. When the fascists entered Terrassa, one of my grandfather’s brothers, Pascual, who was wounded in battle on July 19 in Barcelona, disappeared, apparently shot by the Phalangists. My grandfather Eliseo went into exile, first in a concentration camp in Algeria and then later in a labor battalion working on the fortifications of the Atlantic Wall, from which he would escape in order to take refuge in the mountains, barely surviving in the forest as a charcoal burner. He took part in the Maquis of The Gers, not so much out of his own political inclinations, but because it was the only way he could survive. He would participate in the liberation of the town of Mirande, where he lived until his death in 1970. Meanwhile, in Barcelona, now occupied by the fascists, my grandmother had to somehow get by with five young children. They were very hungry and very afraid. I will recount a couple of anecdotes from those hard times. One day, the padrina de guerra [a “military godmother” whose job was to support the morale of the soldier at the front with encouraging letters, “care packages”, etc.—Translator’s note] of her brother Vicente, who had been forcibly conscripted by the nationalists and was killed by a stray bullet on the Madrid front a few days before the end of the war, arrived at her house, which had been searched several times by the fascist police. The neighbors did not know what was happening: constant police investigations and now all the pomp of a Phalangist leader who came to offer condolences on Amistat Street. And another incident: the forced baptism of my aunts by some Phalangist women. They renamed my aunt Natura, Ana, but she always wanted to be called Nita. My aunt Libertad was renamed Cruz, but everyone called her Nati, so that five years later, when she wanted to get married, the church would not let her, because her birth names Cruz/Libertad did not coincide. The church finally yielded since the only alternative was for the couple to live “in sin”. The absence of my grandfather, in a bleak, unjust and hostile world, led them to ask many questions, which received no other response than that he was guilty of having lost a war, before I was even born. Who has exercised the greatest influence on you? My parents, and their perseverance in the pursuit of education, freedom and justice, goals that they managed to reach by way of reading, hard work and culture; and their demanding ethical standards, which intransigently rejected alcohol, gambling and all other vices, as the traps of capital and the employers. The example of their lives, during my innocent and happy childhood in a world of fascist values, will always be the beacon that illuminates my horizon. In History: the work of the medievalist Georges Duby, Broué, Brinton, Bolloten, Bernecker, Carr, Peirats, Volin, Michelet, Soboul, Mathiez and Abel Paz. In Theory: Darwin, Canfora, Marx, Kropotkin, Rocker, Munis, Dauvé and Cahiers Spartacus. In Literature: Quevado, Cervantes, Shakespeare, Troyes and the medieval literature published by Siruela, Gide, Malaquais, Yourcenar and Diderot, not to forget the Meditations of Marcus Aurelius, The Adventures of Ulysses by Lamb and The Nature of Human Brain Work by Joseph Dietzgen. What led you to study the Civil War? My family history. The oppressive reality of Francoism, a dictatorship without any other justification than its victorious war against its own people, and especially against the working class. I thought it was necessary to answer these two questions: Why was the war lost? Why was the revolution defeated? Why have you devoted yourself to history? To gain, to disseminate and to foster a more profound knowledge of revolutionary history, to refute the falsehoods and distortions designed or spread by the “sacred” bourgeois history. To reveal the real history of the class struggle, written from the point of view of the revolutionary proletariat, is already itself a struggle for history, for revolutionary history. A struggle that forms part of the class struggle, like any wildcat strike, factory occupation, revolutionary insurrection, The Conquest of Bread or Capital. The working class, in order to appropriate its own history, must fight against social democratic, neo-Stalinist, Catalanist, liberal and neo-Francoist views. The proletarian struggle to understand its own history is one struggle, among so many others, in the ongoing class war. It is not purely theoretical, or abstract or banal, because it forms part of class consciousness itself, and is defined as the theoretical understanding of the historical experiences of the international proletariat, and it is undeniable that Spain must understand, assimilate and appropriate the experiences of the anarchosyndicalist movement of the 1930s. What lessons can be drawn from the Civil War? The capitalist state, both its fascist as well as its democratic versions, must be destroyed. The proletariat cannot conclude any kind of alliance with the republican (or democratic) bourgeoisie in order to defeat the fascist bourgeoisie, because such an agreement already presupposes the defeat of the revolutionary alternative, and the renunciation of the revolutionary program of the proletariat (and of its methods of struggle), for the purpose of adopting an anti-fascist unity program with the democratic bourgeoisie, in the name of winning the war against fascism. What were the functions of the Defense Committees? How did they relinquish power? What happened to the Defense Committees after the counterrevolution of May 1937? It would take me much too long to respond to these questions. These questions are addressed in my book, The CNT Defense Committees in Barcelona. Their principal limitation was their inability to organize and carry out coordination outside the confederal apparatus. The superior committees politically and organizationally suffocated the revolutionary committees, which had become their worst enemies and the most serious obstacle to their long-sought necessary integration into the apparatus of the bourgeois state, with the final goal of their institutionalization. What kind of relations and what kinds of differences existed between the Defense Committees and the anarchist affinity and action groups? The Defense Committees could be defined as the revolution’s underground army, deeply devoted to serious tasks related to information, armaments, training, strategy and preparation for the workers insurrection. They were institutionally subordinate parts of the CNT, because they were financed by the trade unions and it was the members of the latter that filled their ranks. The affinity groups constituted the organizational structure of the FAI. They were basically groups of friends and/or militants, united by ideological affinity, who assumed common tasks, positions and tactics. The Iberian Anarchist Federation (FAI) was merely a common platform, or coordinating center, for affinity groups, which often disagreed with the Peninsular or Regional Committees. The action groups, during the era of pistolerismo (1917-1923), were formed as groups for the self-defense of the trade unionists and of the organization, because their only purpose, faced with the brutal terrorism of the state, and the militarization and financing of the gunmen of the Free Trade Union by the Catalan employers association, was to ensure the mere survival of the CNT militants, in order to prevent the disappearance of the CNT as a result of the assassination of its members and the resulting massive resignations of trade unionists. Was there a revolution in 1936? Did the CNT’s pact with the Generalitat put an end to the possibility of revolution? In July 1936, in Barcelona, there was a revolutionary situation. For the first time in history, however, a victorious insurrection of the revolutionary workers did not seize power, it left the apparatus of the bourgeois state intact. The CNT-FAI, which was the dominant working class organization in Barcelona and Catalonia, did not possess an adequate revolutionary theory and opted for collaboration with the other anti-fascist organizations and chose to participate in the governmental tasks of the autonomous government of the Generalitat. Its only goal was to win the war against fascism. Its leaders renounced the revolution at the very moment when the revolutionary neighborhood committees (in Barcelona) and local revolutionary committees (throughout Catalonia), the factory committees, the committees of the barricades, the supply committees and committees of all kinds, were expropriating the property of the bourgeoisie, the Church and the state, in the absence of any visible forces of public order (which were all biding their time, waiting for the counterrevolution). Why were the barricades of July 1936 successful while those of May 1937, raised against the Stalinists, were not? The difference between the insurrections of July 1936 and May 1937 resides in the fact that, in July, the revolutionaries were unarmed, but possessed a precise political goal—the defeat of the military uprising and of fascism—whereas in May, with arms and organization superior to what they possessed in July, they were politically disarmed. The working class masses would begin an insurrection against Stalinism and the bourgeois government of the Generalitat, with overwhelming popular support and with their organizations, and without their leaders, but they would prove to be incapable of pursuing the fight to the end without their organizations and against their own leaders. The barricades raised in July of 1936 were still standing months later, while those built in May of 1937 would disappear immediately, except for a few that the PSUC would allow to remain as a testimonial to its power and to its victory. What was the cause of May 1937? May 1937 was undoubtedly the consequence of the growing discontent with rising prices, food shortages, the internal struggles underway in the enterprises for the socialization of the economy and workers control, the escalation of the Generalitat’s efforts to disarm the rearguard and to obtain control over the forces of public order, etc., etc., and was above all the result of the necessary armed defeat of the proletariat, which required that the counterrevolution must finally put an end to the revolutionary threat to the bourgeois and republican institutions. Who are the persons who are most responsible for distorting and falsifying the history of the Civil War? It is not so important who distorted it, as the fact that it was distorted. Those who do the distorting are the same ones as always: neo-Stalinists, social democrats, liberals, Catalanists and neo-Francoists, that is, the sacred history of the bourgeoisie. Can you provide us with an example of such distortion? For instance, the confrontation between the CNT and the PSUC. This was a political conflict, in the Greek sense of the term, that is, a struggle between two different strategies with regard to the provisioning of the Barcelonian “polis”: that of the neighborhood committees, which placed the highest priority on the egalitarian, efficient and adequate distribution of bread and staple foods; and that of the PSUC, which sought to reinforce the power of the government of the Generalitat regardless of any other considerations. And this strategy of the PSUC required, above all else, the liquidation of the neighborhood committees and the imposition of the free market. The free market meant completely unrestricted prices, and favored the enrichment of the small shopkeepers, at the cost of the hunger of the population. The ideological and theoretical justification of the PSUC was that the free market, and unrestricted prices, favored the distribution on the market of products that would otherwise be hoarded. What actually took place was that the free market fostered the hoarding of food and speculation, resulting in higher prices. The theoretical free market would rapidly become a black market, and hunger soon spread among the workers. The official prices of staple foods, which were acquired with a ration card, were only nominal, because the supplies were immediately exhausted and they could only be obtained on the black market. The statistics do not reflect this shortage of regulated staple foods. Nor do they reflect the prices on the black market, which only responded to the law of demand. Anxiety, hunger, waiting for hours in long lines, and the expeditions to the agricultural towns to get supplies of food by means of barter, coercion, looting or robbery became generalized for the entire population of Barcelona after the spring of 1937. Beginning in February 1938, the provisioning of the city would be militarized; this militarization would be complete by August 1938, when three categories of rationing would be established: combatants, armed rearguard and civil population. The Stalinists and the bourgeoisie tried to defeat the revolutionaries by means of hunger. Can you provide some names of those who have falsified our history? Miquel Mir, of the junkyard school of history. Rather than a historian, he is a novelist and a deceiver who invents, manipulates and modifies documents. He is financed by the Cercle Eqüestre, a Catalan aristocratic association with profoundly Francoist convictions. His attempt to defame the anarchists failed and discredited the Catalan upper bourgeoisie, whose ancestors were so frightened by the anarchists in 1936. Pío Moa, César Alcala and others of the same ilk, from the neo-Francoist school. They repeat the usual fallacies of the Francoists and the extreme right, for the purpose of justifying and praising the bloody massacres under the Dictatorship of the Galician Franco: Martín Ramos and a long etcetera of the neo-Stalinist school. They dominated most of the Catalan universities for many years. They dogmatically denied that a social revolution took place in Barcelona in 1936, going so far as to refuse to recognize it as a school of historiography. Today they reject the notorious name of Stalinists and prefer to consider themselves to be social democrats. They hate the anarchists and are the main proponents of the black legend of Catalan anarchism, whose adepts are depicted as bloodthirsty vampires … originated and propagated by the saintly founders of the PSUC and their predecessors (Max Rieger, Ehrenburg, Stepanov, Perucho) whose purpose was to transform advertising partners into forgers of reality, at the same time that they unleashed the repression against the CNT in the summer of 1937, which would cause the CNT to disappear in many areas and would fill the prisons with thousands of libertarian prisoners. They claim to be objective and scientific, but they are fiercely sectarian and the most effective defenders of the obsolete capitalist system and the corrupt democratic bourgeoisie. Their works are published in the journal L’Avenç (and by the publisher of the same name) and in El Viejo Topo. This list of university figures would omit a handful of notable exceptions: Izard, Muniesa, Pagès … and a few others. From the neo-liberal school, there are prestigious historians like Viñas, or Catalans marginalized by their neo-Stalinist colleagues, like Ucelay Da Cal. They are more intelligent and less compromised than the neo-Francoists, and less dogmatic than the neo-Stalinists. They are destined to succeed and replace them, if only as a result of the generational decline of the now obsolete divide between Francoists and anti-Francoists. One of the alternatives to collaborating with the Generalitat was the “Go for Everything” strategy, as it was called by García Oliver, which he defined as an anarchist dictatorship. Regarding this “Go for Everything” strategy; was it not a possible option for the revolution? Could it have put an end to the power of the ruling bourgeoisie? At the CNT-FAI headquarters, which occupied the two buildings confiscated from the Employers Association and the Casa Cambó, the proposal of Companys that the CNT should participate in a Central Committee of Anti-fascist Militias was submitted for the formal approval of a Regional Plenum of Trade Unions, convoked by the Regional Committee of Catalonia. After the introductory report read by Marianet, José Xena, representing the district of Baix Llobregat, proposed the withdrawal of the CNT delegates from the CCMA and a commitment to carry on with the revolution and establish libertarian communism. Juan García Oliver stood up following the debate and characterized the decision that had to be made as a choice between an “absurd” anarchist dictatorship and collaboration with the other anti-fascist forces in the Central Committee of Militias in order to continue the struggle against fascism. In this way García Oliver, whether deliberately or not, rendered the confused and ambiguous choice of “Go for Everything” unviable. As opposed to an intransigent “anarchist dictatorship”, the defense presented by Federica Montseny of the principles of anarchism against all dictatorships would appear to be more logical, balanced and reasonable, reinforced by Abad de Santillán’s arguments about the perils of isolation and foreign intervention. A third position would emerge, advocated by Manuel Escorza, who proposed that the government of the Generalitat be used as an instrument of socialization and collectivization, which would then be dismantled when it ceased to be of use to the CNT. The Plenum proved to be in favor of the collaboration of the CNT with the other anti-fascist forces on the Central Committee of Militias, and voted against the proposal of the representative from Baix Llobregat. The majority of those who attended the Plenum, including Durruti and Ortiz, remained silent, because they thought, like so many others, that the revolution had to be postponed until the problem of Saragossa was resolved, and fascism was defeated. A resolution was passed, without any more debate or philosophizing, to consolidate and institutionalize the Liaison Committee between the CNT and the Generalitat, which had been formed before July 19, and transform it, reinforce it and expand it into the CCMA which, by means of the anti-fascist unity of all its component parties and trade unions, would be responsible for imposing order on the rearguard and organizing and supplying the militias that had to fight the fascists in Aragon. The authentically revolutionary alternative was not the “Go for Everything” of García Oliver, which was nothing but the seizure of power by a minority of anarchosyndicalist leaders, but the revolutionary committees that were in the streets, expropriating the factories, recruiting and equipping the militiamen, manning the barricades, running the city’s services, forming security patrols … and, in a word, replacing all the state functions and exercising all power, in practice. Who is the revolutionary figure of 1936 for whom you hold the highest esteem? And why? The revolutionary committees of the Barcelona neighborhoods, because they were the potential organs of power of the working class. Can there be a revolution without violence? For revolutionaries, the great lesson of the revolution of 1936 is the unavoidable necessity of destroying the state. Violence is not a question of will or ethics, but of the relation of forces between the classes in struggle. Law and order can only be understood as institutionalized violence. Law and order is opposed to and confronted by revolutionary violence. The state defends the institutions of bourgeois society and possesses the monopoly of violence, which it exercises by way of the so-called forces of law and order, and this state of affairs appears to be the “normal condition” of capitalist society. Revolutionary violence, which shatters this monopoly, is presented as an exceptional, chaotic, arbitrary and abnormal phenomenon, that is, as an alteration of bourgeois law and order, and therefore as criminality. The military uprising made it clear that violence was the solution to social and political conflicts. In a war conflicts are resolved by killing the enemy. The exceptional situation of institutional crisis and social revolution, provoked by the military uprising and the civil war, proved to be a fertile terrain for the multiplication of revolutionaries, slandered as “incontrolados”, who would execute justice on their own account. In a situation characterized by the collapse of all institutions and a power vacuum, the revolutionary committees, and also some specialized investigative committees, would assume the job of judging and executing fascist enemies, and trying all those suspected of being enemies, priests, landowners, rightists, rich or disaffected. And the weapons they held in their hands were used to exercise this power and to carry out the “duty” of exterminating the enemy. Because it was time to deliver the death blow to fascism, and there was no alternative but to kill or be killed, because they were at war with the fascists. If no one ever blames a soldier for killing an enemy, why would anyone be blamed for killing an enemy by ambushing him in the rearguard? In a war, the enemy is killed for being an enemy: there is no other law, or any other kind of moral rule, or philosophy. After the passage of many years, learned academics elaborate complicated elucidations and theories in explanation, but all the historical documents on the subject indicate that the militia was never “passive” when faced with a priest, an employer or a fascist, it applied a very simple rule: in a war, the enemy kills you, or you kill the enemy. Everyone from Federica Montseny, the Minister of Health, to Pasqual Fresquet, Captain of the Death Brigade; from Vidiella of the PSUC, Minister of Justice, to the PSUC group leader Àfrica de les Heras; from Joan Pau Fàbregas of the CNT, Minister of the Economy, to the most humble militiaman or member of the control patrols, all, absolutely all of them, argue with exactly the same reasoning. Are violence and revolution inseparable? Violence and power are the same thing. In eras of revolutionary violence, as long as there is more destruction (of the old order) than construction (of the new order), the revolutionaries cannot rule, and always encounter their executioners, anonymous or not. From the French Revolution to all the others. But when this violence, which emerged in connection with the revolutionary situation of July, and an atomized power, began to be subjected to regulation in October 1936 (in its new character as legitimate and/or legal violence of the “new” public order) by the new anti-fascist authorities, it ceased to be revolutionary, collective, popular, just, festive and spontaneous violence, because it was then transformed into a cruel phenomenon, alien and incomprehensible to the new counterrevolutionary, bourgeois, republican, centralized and monopolist order, which was established precisely for the purpose of controlling and extirpating the previous revolutionary situation. Federica Montseny, at the rally in the Olympic stadium on July 21, 1937, would denounce the judicial harassment of CNT members, who were undergoing vicious persecution for the revolutionary events of July, because they did not consider it a crime or murder to have killed priests, military personnel, gunmen or rightists, solely because they were priests, etc. And this criterion was shared by the immense majority of anarchosyndicalists. In September, when this persecution would also affect the militants of the UGT, Vidiella (PSUC) would use arguments similar to those of Montseny. What lessons can be learned from the experiences of the anarchosyndicalists and from the Revolution of ’36? During the Civil War, the political project of statist anarchism, which constituted itself as an anti-fascist party, utilizing methods of class collaboration and government participation, bureaucratically organizing for the principal goal of winning the war against fascism, would fail miserably on every terrain; but the social movement of revolutionary anarchism, organized in revolutionary neighborhood committees, local committees, committees for workers control, defense committees, etc., would constitute the embryo of a workers power that would carry out feats of economic management, popular revolutionary initiative and proletarian autonomy that even today illuminate and anticipate a future that is radically different from capitalist barbarism, fascist horror or Stalinist slavery. Even though this revolutionary anarchism, however, would finally fall victim to the systematic and coordinated repression directed at it by the state, the Stalinists and the superior committees, we have been bequeathed the example and the struggle of minorities, such as the Friends of Durruti, the Libertarian Youth and various anarchist groups in the Local Federation of Barcelona, whose examples allow us to engage in theoretical reflection on their experiences, learn from their errors and keep their struggle and their history alive. After the victorious insurrection of the workers and the defeat of the army, and after the forces of law and order refused to leave their barracks, the destruction of the state ceased to be an abstract futuristic utopia. The destruction of the state by revolutionary committees was a very real and concrete task, in which these committees assumed all the roles that the state had exercised prior to July 1936. Have you censored yourself or been censored? Never. I prefer not to publish if subjected to censorship of any kind. Tell us about the books you have published and intend to publish in the future. 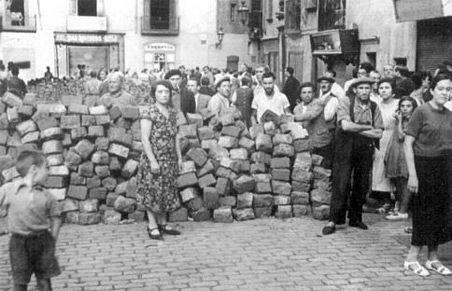 Barricades in Barcelona is an attempt to explain how the ideology of anti-fascist unity was based on the abandonment by the superior committees of any revolutionary program, in the name of winning the war against fascism. This book was also published in a French edition. The CNT Defense Committees in Barcelona (1933-1938) is an introduction to the topic of the war and the revolution in Catalonia from the perspective of these clandestine institutions of a revolutionary army, which is what the defense committees became. This book has been published in an Italian edition. The Revolution of the Committees (July-December 1936) is the first volume of a trilogy that will be followed by The War for Bread (December 1936-May 1937) and The Repression of the CNT (May-September 1937). These three books share a common subtitle: Hunger and Violence in Revolutionary Barcelona: From July to December 1936). The second and third volumes of the trilogy are awaiting publication. Each of these books may be read independently of the others, but it is obvious that they form part of the same work on the Spanish Revolution, in Catalonia, which allows the participants to speak for themselves, it is full of previously unpublished documents and basically addresses hunger and revolutionary violence, revealing and shedding light on how the Stalinists and the government of the Generalitat would defeat the revolutionaries by means of hunger and the restoration of the monopoly over violence in the Barcelona rearguard. You are the director, historian, editor and distributor of the history journal, Balance. Could you provide us with a balance sheet for Balance? Balance has been published since 1993. It is an attempt to rehabilitate “the damned” of the Civil War, who have on so many occasions been rejected, “forgotten”, “sanctified” or slandered by their own organizations and more generally by the bourgeois “sacred history”: Josep Rebull (left wing POUMista), the Friends of Durruti, Munis, Fosco, Mary Low, Benjamin Péret, Balius, Orwell, Nin, etc. It also deals with the Stalinist murderers: Gero (Pere), Stepanov, and their Spanish fellow travelers. Various issues of the journal, such as the one dedicated to the Friends of Durruti and others, have been translated and published in English, French, Italian, etc. Many of these articles can be consulted at the website of “La Bataille Socialiste”: http://bataillesocialiste.wordpress. Where can your books and the journal, Balance, be purchased? At the Barcelona bookstores Aldarull (Torrent de l’Olla, 72) and La Rosa de Foc (Joaquín Costa 34). In Madrid at La Malatesta (Jesús y Maria 24). On the internet, at the website: http://www.lamalatesta.net/product. Tell us about your column in Catalunya, the “Militant’s Dictionary”, which can be found on the back of every issue. It is an attempt to publicize the history of the workers, and the biographies of its militants, as well as the basic concepts of the workers movement: Seguí, Ascaso, direct action, the lockout, the unitary trade union, Stalinism, capitalism…. You are also an active member of l’Ateneu Enciclopèdic; what do you do in that group? Archive, catalogue and classify old papers, like those of Abel Paz and others. What is your assessment of the current state of the workers movement? Struggle or death. Revolution or barbarism. The proletariat is not just the industrial working class, it is not just the active working population, it includes not only all the wage earners, but also the unemployed, the temporary workers, the retirees, and everyone who does not have reserves on which they can survive. At the present time we are witnessing a merciless attack by capital and the state on the living conditions of the proletariat. This attack can only be answered by class struggle. Without this struggle the proletariat will have no more perspective than the sixty million killed by the Second World War and the destruction of the greater part of world industry. What is your opinion of today’s libertarian movement? Amidst a hard reality, in these hopeless and drab times, we can feel the grass growing. The social, political and economic situation of this country, and not just this country, is explosive. The system has no solution to the crisis. There is no future for anyone. The only way out, the only realistic option, is struggle, either to destroy the state, which is the guarantor of the system’s perpetuation, or to dispute with capital and/or the state over wages and welfare, in which only a pitiless struggle can succeed. What do you think of the divisions within anarchosyndicalism and the libertarian movement? They should have the ability to act in unison, based on diversity and mutual respect, and emphasize what they have in common rather than what separates them. They should go forward together, strike in unison, build a house where they can all live together. You are most sympathetic to the Friends of Durruti, the CNT members who were critical of the collaboration of the leaders of the CNT. What can we learn today from their ideas and their practice? While the superior committees were meeting to subordinate everything to victory in the war against fascism, the neighborhood committees, in the streets, were still fighting for the program of a workers revolution. The process of institutionalization initiated by those superior committees of the CNT-FAI would transform them into servants of the state, the worst enemies of which were the revolutionary neighborhood committees, as the Regional Committee would define them at the meeting of the superior committees of the libertarian movement held on November 25, 1936. The institutionalization of the CNT would inevitably have important consequences for its organizational and ideological character. The entry of the most well-known militants into various levels of the state administration, from city councils to cabinet ministers of the republican government, and ministers of the Generalitat or new “revolutionary” institutions, would create new functions and needs that would have to be addressed by a limited number of militants in order to carry out the responsibilities of the posts to which they were appointed. The functions of direction and power exercised by these superior committees would create a set of interests, methods and goals that were different from those of the confederal rank and file militants. This resulted in generalized demobilization and disillusionment among the affiliated organizations and rank and file militants, who were facing hunger and repression. It also led to the emergence of a revolutionary opposition, basically embodied in the Friends of Durruti, the Libertarian Youth of Catalonia, some anarchist groups from the Local Federation of the Affinity Groups of Barcelona, especially after May 1937, an opposition which had, however, already developed, in the summer of 1936, in the neighborhood and defense committees of the residential areas of Barcelona. A new phenomenon would arise, closely watched and of great concern—the appearance, already in July 1936, of a Committee of Committees, a kind of highly concentrated executive committee composed of well-known leaders which, given the importance and urgency of the problems that had to be resolved, problems that could not possibly be addressed by way of slow horizontal and assembly-based processes and their long debates, replaced the organization with regard to decision-making. This Committee of Committees, which the superior committees would convene in secret sessions, was publicly consolidated, in June 1937, under the name of the Political Advisory Commission (PAC), and one month later in the so-called Executive Committee of the Libertarian Movement. As a result, a clear dividing line was drawn between state anarchism and revolutionary anarchism. Existence precedes consciousness. Without theoretical reflection on the historical experiences of the proletariat, there can be no revolutionary theory or theoretical progress. There could be a time lag between theory and practice, of greater or lesser duration, in which the arms of critique are transformed into the criticism of arms. When a revolutionary movement makes its appearance in history it makes a clean break with all dead theories, and the long-awaited moment for revolutionary action arrives, which alone is worth more than any theoretical text, because it reveals the errors and insufficiencies of theory. This practical experience, lived collectively, levels useless barriers and transcends their clumsy limitations, which had been established during the long counterrevolutionary periods. Revolutionary theories prove their validity in the historical laboratory. Class frontiers excavate a deep chasm between revolutionaries and reformists, between anti-capitalists and the defenders of capitalism. Those who wave the flag of nationalism, sentence the proletariat to disappearance or defend the eternal nature of Capital and the State are on the other side of the barricades, whether they call themselves anarchists or Marxists. The choice must be faced by revolutionaries, who seek to abolish all borders, tear down all flags, dissolve all armies and police forces, destroy all states; either make a clean break with every kind of totalitarianism and messianism by self-emancipatory and assembly-based practices, put an end to wage labor, surplus value and the exploitation of man throughout the entire world; put a stop to the threat of nuclear annihilation, defend natural resources for future generations … or become preservers of the established order, guardians and spokespersons for its owners, and defend capitalism and make excuses for it. The proletariat is summoned to the class struggle by its own nature as a wage earning and exploited class, without any need for any kind of teaching; it engages in the struggle because it needs to survive. When the proletariat is constituted as a conscious revolutionary class, confronting the party of capital, it needs to assimilate the experiences of the class struggle, it must look for support in its historic conquests, both theoretical and practical, and overcome its inevitable mistakes, critically correct the errors it does make, reinforce its political positions by means of reflection on its shortcomings or omissions, and complete its program, in short, resolve the problems that were not resolved previously. It is necessary to learn the lessons that history itself has provided. And this learning process can only take place in the practice of the class struggle of the different revolutionary affinity groups and the various organizations of the proletariat. Could you suggest someone for us to interview? Interview with Agustín Guillamón conducted by Txema Bofill. First published in Catalunya: Òrgan d’expressió de la CGT de Catalunya, No. 149 (April 2013). Translated from the Catalan original in May 2013.